Back in February 2012, the unemployment rate was 7 percent in Clarke County and 5.9 percent in Oconee County. While both of these Northeast Georgia counties could boast of lower unemployment than the state as a whole, neither did much bragging. Now economic development folks across the region can’t stop talking about their unemployment numbers. “The unemployment rate was the lowest in the state in metro Athens in April ,” says Ryan Moore, director of the Athens-Clarke County Economic Development Department. The reason for the area’s good fortune can be found in one word: Caterpillar. For those of you who’ve been living under a Georgia economic development news blackout the past couple of years, here’s a little background. In 2011, heavy equipment manufacturer Caterpillar decided to move production of small track-type tractors (STTT) and mini hydraulic excavators (MHE) from Japan to the United States – reshoring, it’s called. The folks at Caterpillar put the word out, were shown property near the intersection of Atlanta Highway and Georgia 316 in Athens, and 64 days later announced they’d found a new home, says Rusty Haygood, economic development director for Oconee County. The facility officially opened in October 2013. The 850,000-square-foot facility, which will be the global source for the STTTs and the North and South American and European source for the MHEs, sits on approximately 135 acres of what is commonly known as the Orkin site. Caterpillar is investing $200 million in the new facility, while county, city and state governments have provided incentives totaling another $75 million, including infrastructure improvements, tax abatements and the land the plant sits on. Caterpillar is expected to employ as many as 1,400 people at the plant by 2018, representing an annual payroll of $57 million, says Mike White, human resources manager at the facility. And that’s just the beginning. Studies done at the time showed an estimated $39 million annual increase in retail sales in Clarke and Oconee counties, which would generate an additional $945,000 in sales taxes per year. In addition, new retail and restaurants were predicted to serve not only Caterpillar employees and their families, but also the employees of vendors and suppliers to Caterpillar that are expected to move into the area. To ensure timely delivery of the huge project that sits on land straddling the Clarke-Oconee county line, collaboration was vital. “Our partnership approach to economic development is what really makes our state stand out as an ideal location for business activity,” says Chris Carr, commissioner of the Georgia Department of Eco-nomic Development. In fact, he adds, “the spirit of collaboration in the region and the state” were important factors in Caterpillar’s choice of location. The two counties have a history of working together, Haygood says. Several years prior to the Caterpillar project, the two counties had jointly courted other companies for the same piece of land. “The groundwork had been laid for collaboration on this project,” he says. An existing intra-governmental agreement spelling out the responsibilities of each county just needed a little updating. Another vital partner in the project is Athens Technical College, whose president, Dr. Flora Tydings, was very involved with the economic development team. “I met with the prospect team several times during the recruitment period” to explain training resources, Tydings says. In addition, the college provided temporary office space for more than 50 Caterpillar employees in the months before the facility opened. The internship program is just one way Caterpillar is supporting education and workforce development in the region. One of the goals they’ve met is in hiring. “We’re actually over 700 employees,” Henry says, then adds how impressed he’s been with the quality of applications Caterpillar has seen – all 20,000 of them. Haygood applauds the speed of hiring and its impact on the community. “The biggest impact is payroll. When you’re employing [more than] 600 individuals, you’ve got a pretty healthy payroll you’re pumping into the economy.” He also points out another important impact Caterpillar is having on the area. “They have as a company integrated themselves into the community.” Executives and other employees participate on boards, in civic organizations and in local activities. 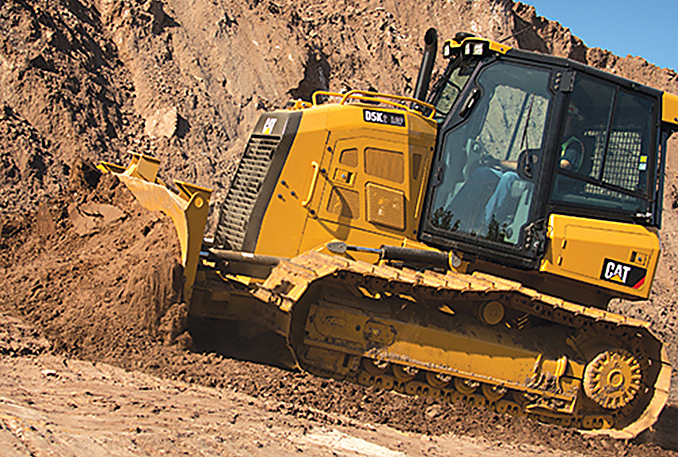 Caterpillar’s impact can be felt across the region as suppliers, such as HK Logistics in Spalding County and Orlaco in Pickens County, have moved in. In addition, existing Georgia companies, like Flambeau in Morgan County and Olympic Steel in Barrow County, are expanding to supply to Caterpillar. In Oconee County, home buying and retail development are also picking up, Haygood says, although he’s not quite ready to attribute 100 percent of the uptick to Caterpillar. Some of the growth in new housing starts, he says, is due to a general improvement in the market and pent-up demand. And a new retail development on Highway 316 was actually started before Caterpillar was announced. “Just so happened, a perfect storm was brewing,” he says about the economy’s improvement.